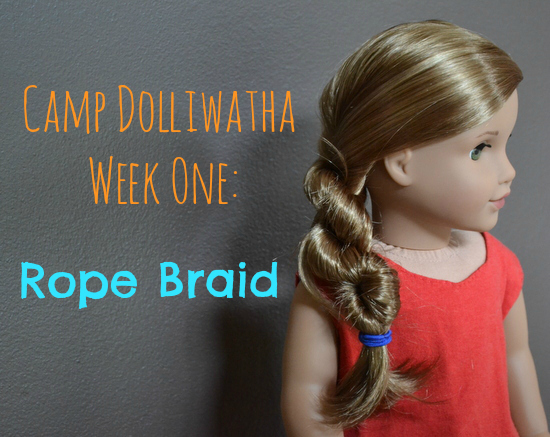 Welcome to the second day of Camp Dolliwatha! Today, I’m not posting a craft, but a hairstyle . 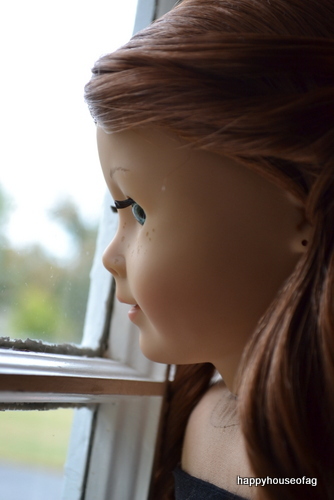 . .
Start by misting your doll’s hair and brushing it, so it’s easy to work with. 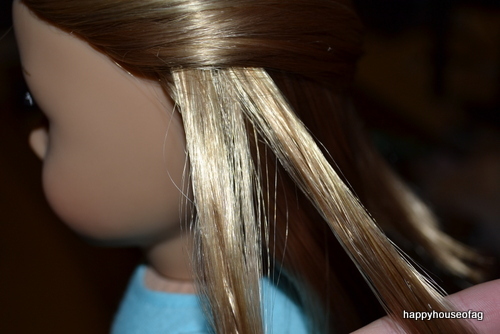 Then separate the hair into two equal sections. 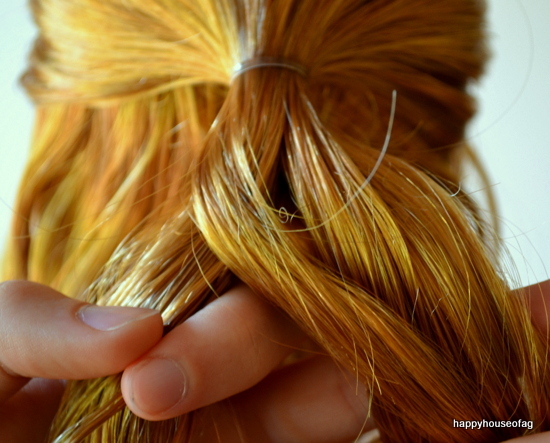 Take one section of hair, keep it close to the neck, and twist it tightly to the left. 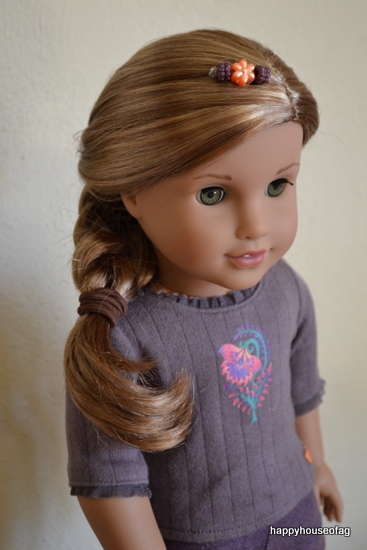 (If you want the rope braid to go over the doll’s left shoulder, twist to the right instead.) 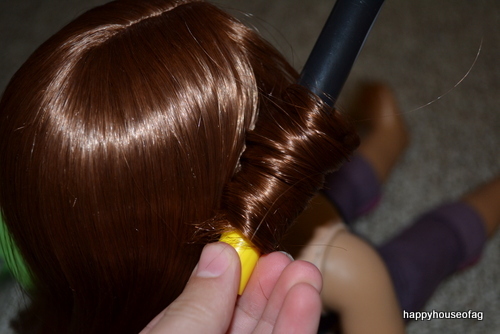 Wrap a hair tie around the end of the coil. Repeat on the other section of hair. 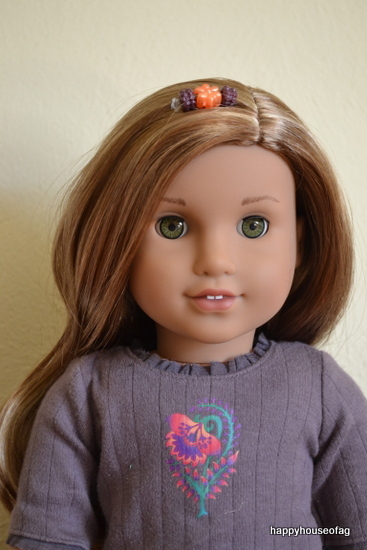 To keep one coil tight while you’re working on the other one, try tucking it under the doll’s arm, or having someone hold it. 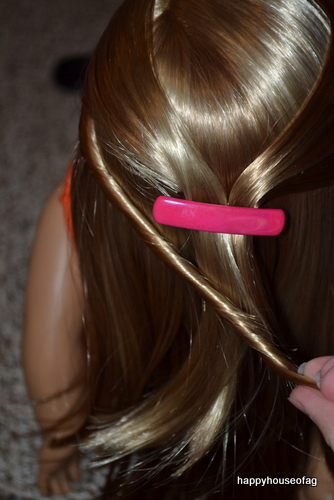 Slip the hair ties off the coils and pinch the ends so they don’t come undone. Twist them around each other, to the right. 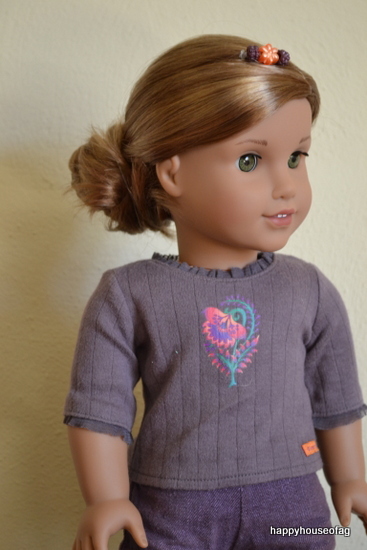 (If you want the rope braid to be on the doll’s left shoulder, twist to the left.) 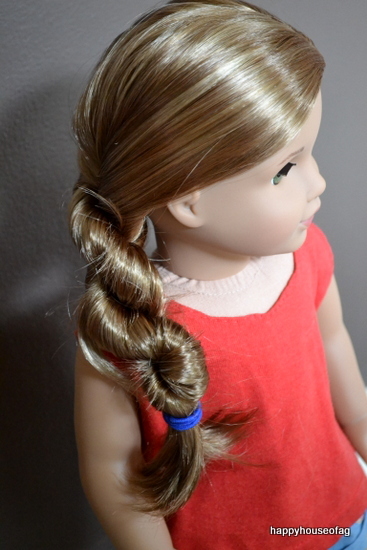 Tie off the end of the rope braid with the third hair band. Tip: Twisting the coils together in the opposite direction that you twisted themselves is what keeps the rope braid together. 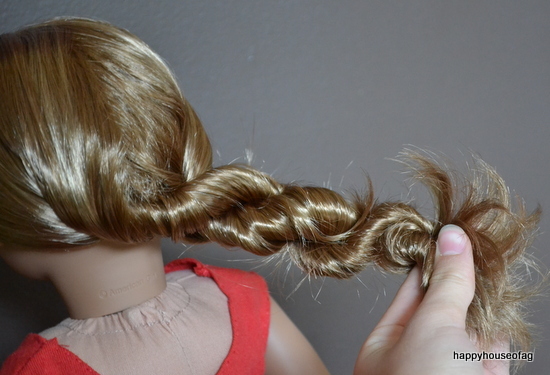 If your braid comes undone, pay special attention to direction when you’re redoing it. 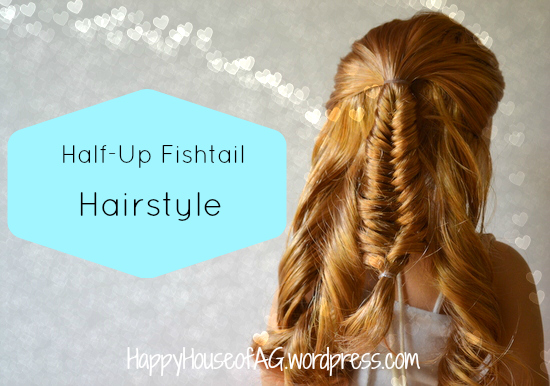 If you did this hairstyle, email me up to three pictures at happyhouseofag@gmail.com. I’ll include your photo(s) in the weekly Camp Dolliwatha recap post on Saturday! 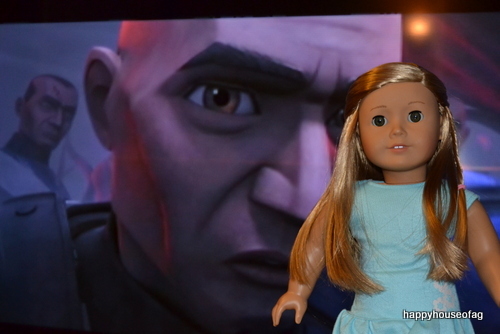 And, of course, a doll. ;) This hairstyle works best on dolls with medium or long hair. 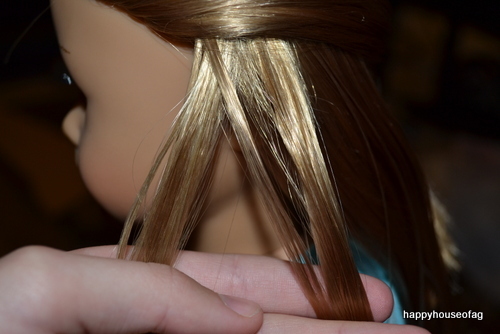 Start by gathering the hair on the upper half of the doll’s head. 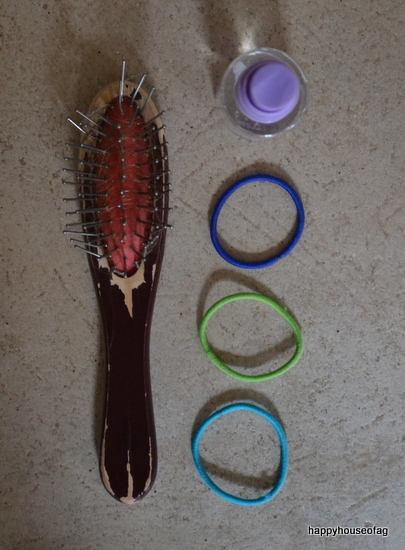 Secure with one of the elastics. 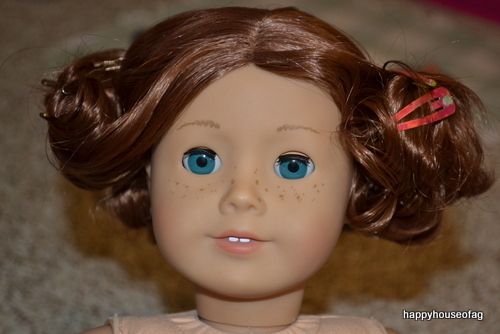 Now you’ve done the half-up part of this hairstyle. 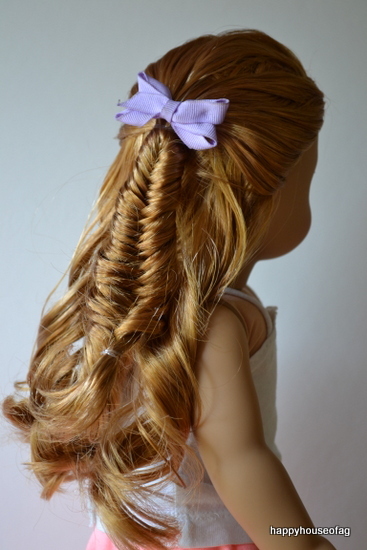 But we still need to do the fishtail. 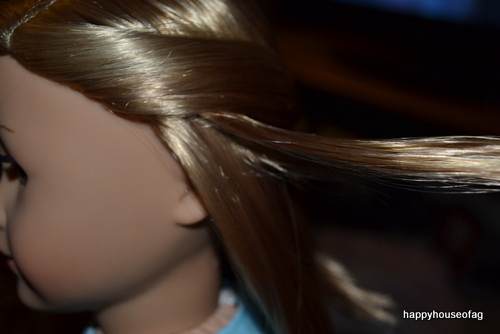 Take the ponytail and split it into two equal parts. 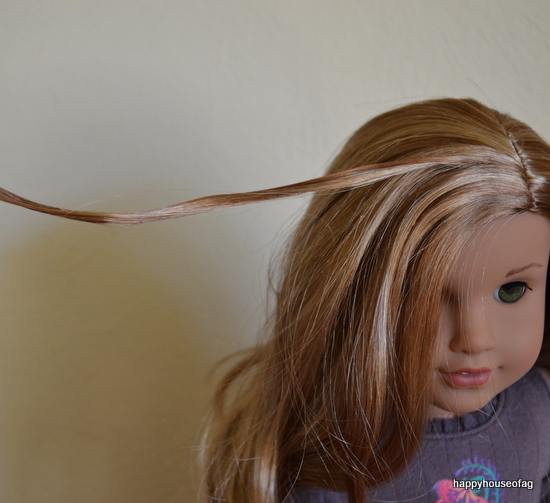 Take a piece of hair from side A (left side). Cross it over and let it merge with side B (right). Then take a section from side B and cross it over to side A. 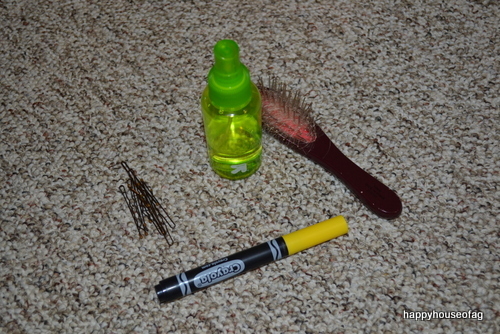 Continue going back and forth between side A and side B until you run out of hair. Tie off with the remaining elastic. 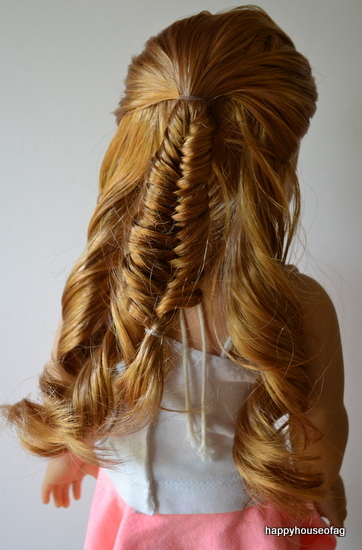 The finished fishtail should look like this. Now you’re finished, simple as that. 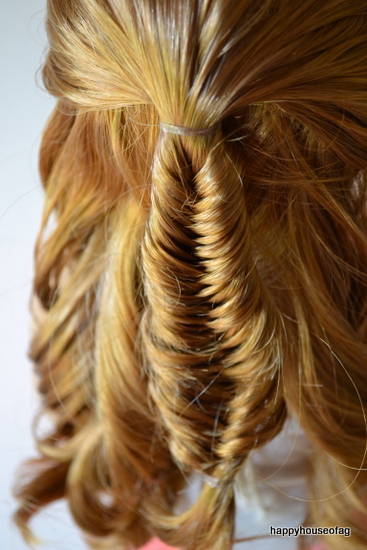 The half-up fishtail is a cute, summery style. 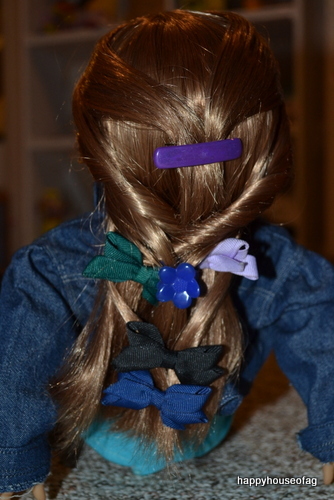 Dress it up by adding a bow or colorful hair extension. 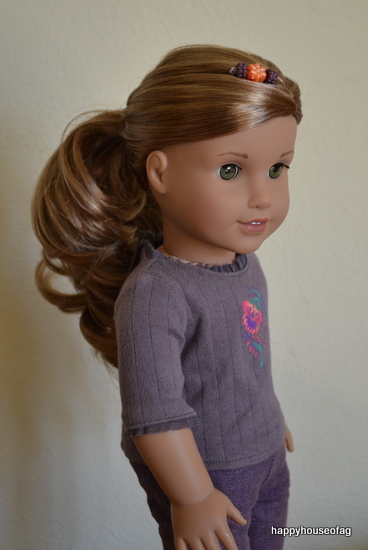 Did you try this hairstyle on one of your dolls? I’d love to see! Email me a picture at happyhouseofag@gmail.com. Hey! 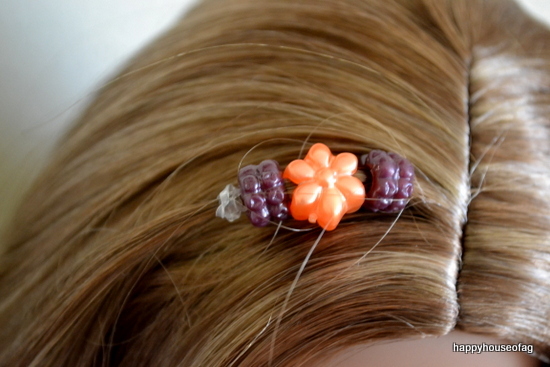 Today, I will be showing you how to put beads in your American Girl doll’s hair. Before we get started, I want to say something about the beads. 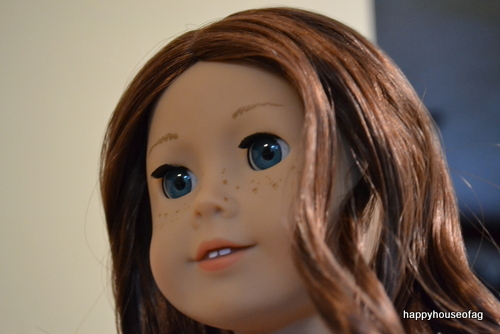 They need to have large holes, or else it will be nearly impossible to put them into your doll’s hair. 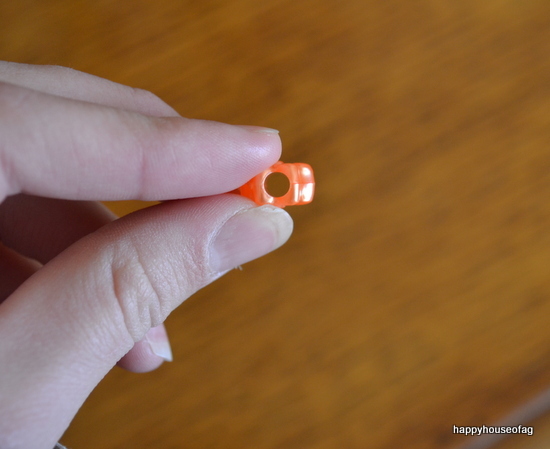 Pony beads work best, but any bead with a large hole will do. 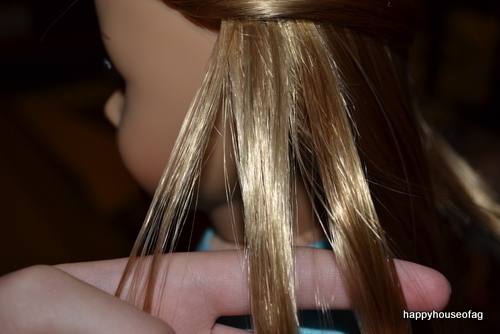 First, take a thin section of hair near the front of your doll’s head. Brush it out and mist it. Make sure that the ends of the section are wet and clumped together. 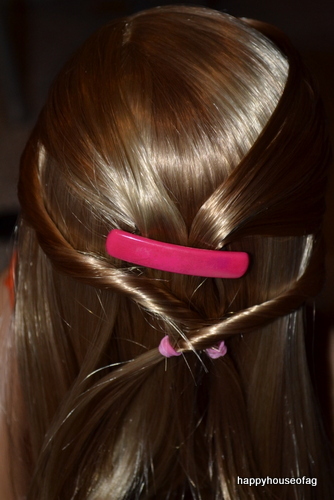 Take the first bead and slip it on the chosen strand of hair. 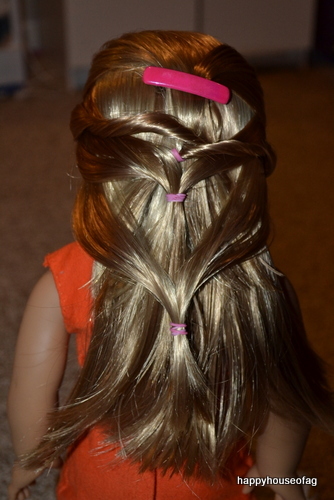 Slide it all the way up to the crown of your doll’s head. 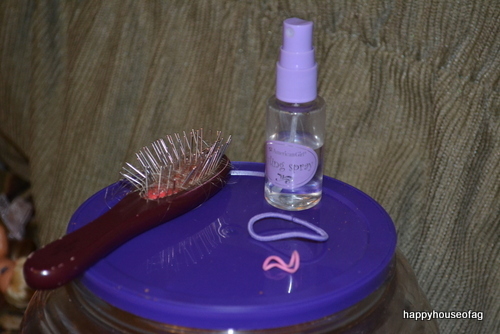 If you can’t get the bead onto the strand of hair, try misting it again. 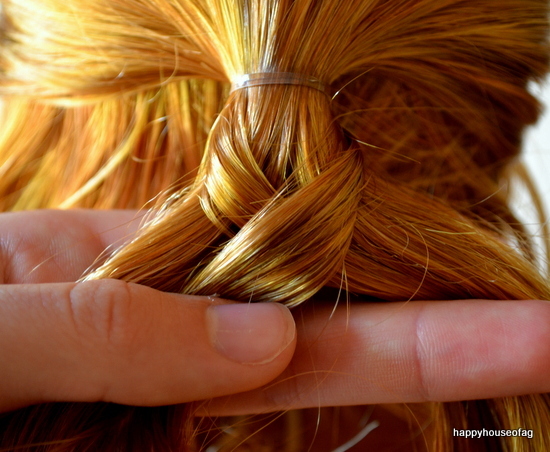 Or twist the ends together, fold the hair in half, and pinch it. 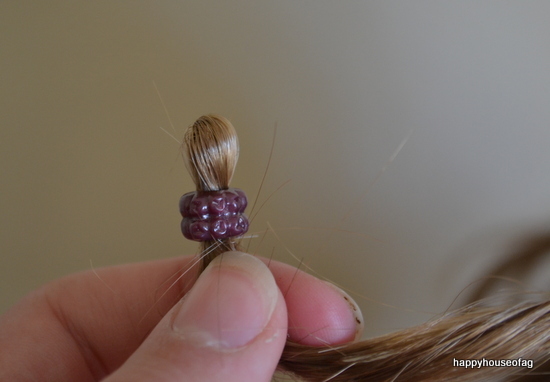 Then slip the bead over the twisted, folded, and pinched piece of hair. 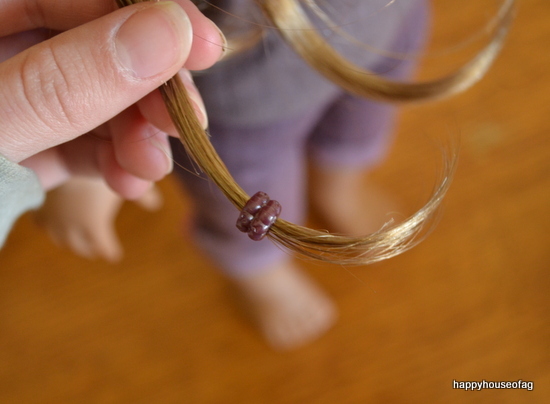 Once you’ve gotten all the beads on the doll’s hair, take a clear elastic. 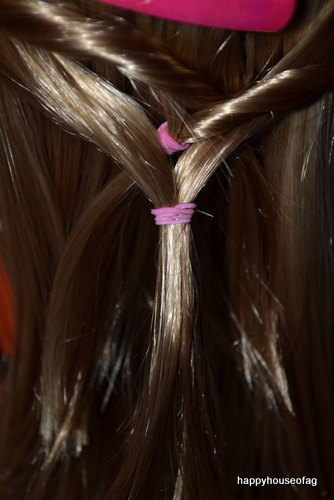 Wrap it around the hair directly below the beads. 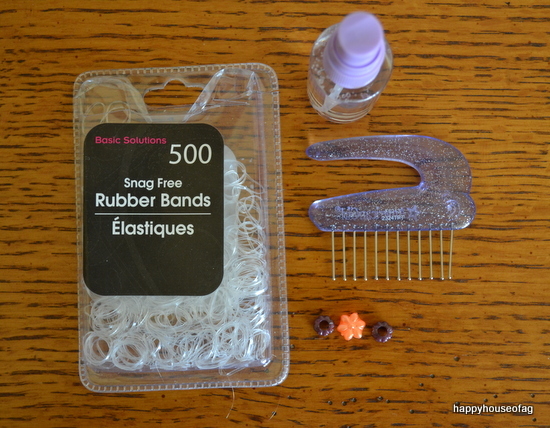 You’ll need to wrap it many times, so it’ll get too thick for the beads to slip over it. Try experimenting with different color combos and different numbers of beads. 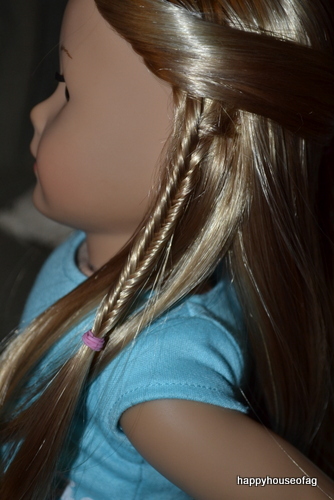 You can do pretty much any style on your doll’s hair while the beads are still in.
. . . braids . . .
. . . a braided bun, etc. 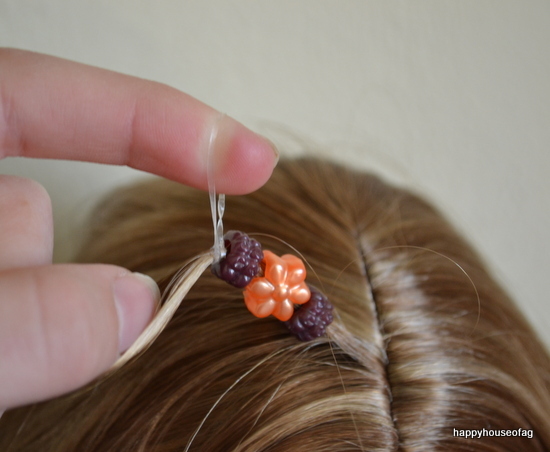 The beads add a colorful pop to any hairstyle; perfect for the warm summer months ahead (which I’m already dreaming about. ;) )! 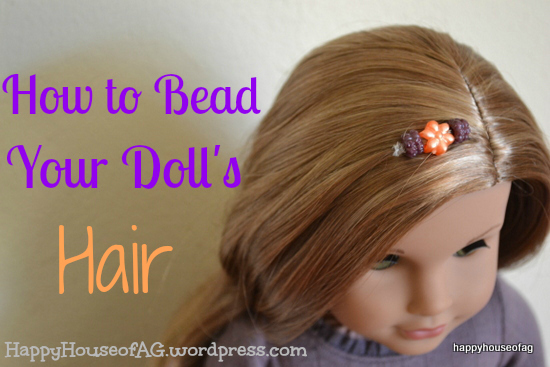 If you decide to bead your doll’s hair, I’d love to see pictures! 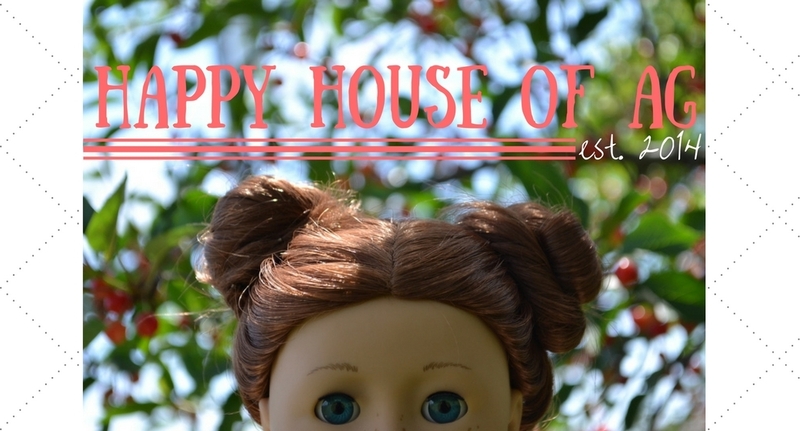 Post a picture on your blog and link back to this post, or email me a photo at happyhouseofag@gmail.com. 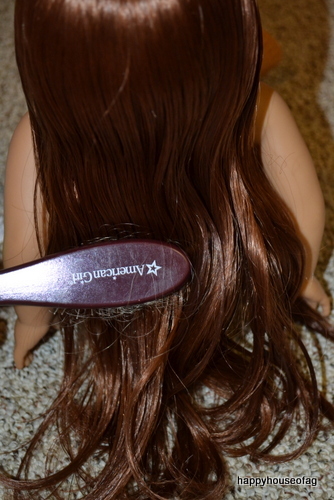 After you brush your doll’s hair, take two medium sized sections from the front. 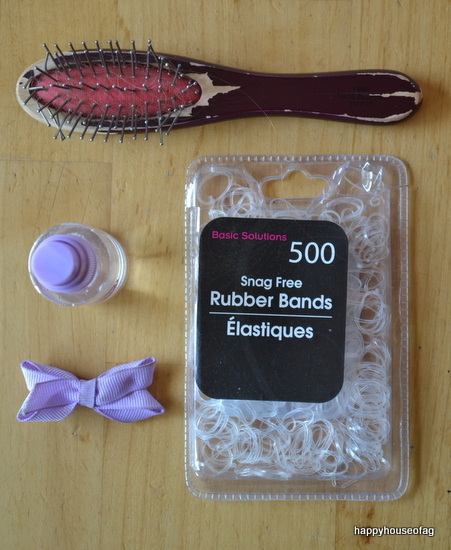 Tie them together in the back with one of your elastics. 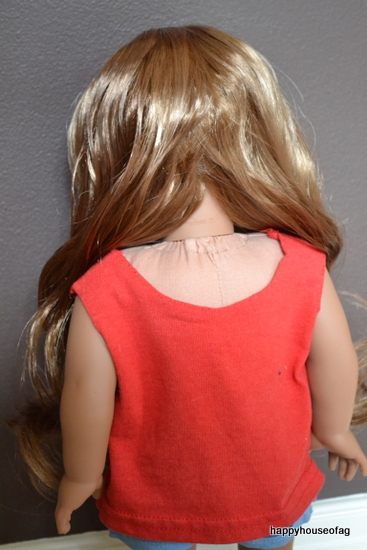 Then take a small (but not tiny) section from behind one of her ears. Divide that section into two even parts. 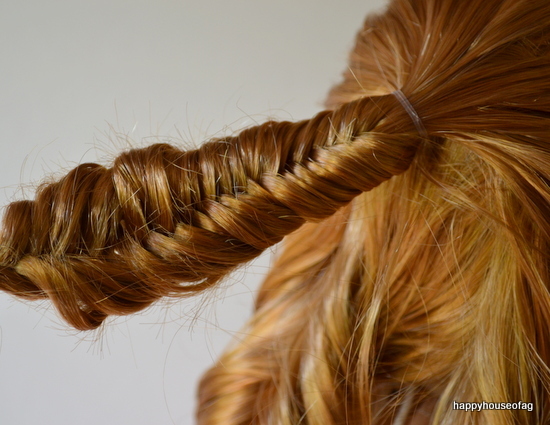 You’re going to fishtail this, so if you don’t know how to fishtail, look below . 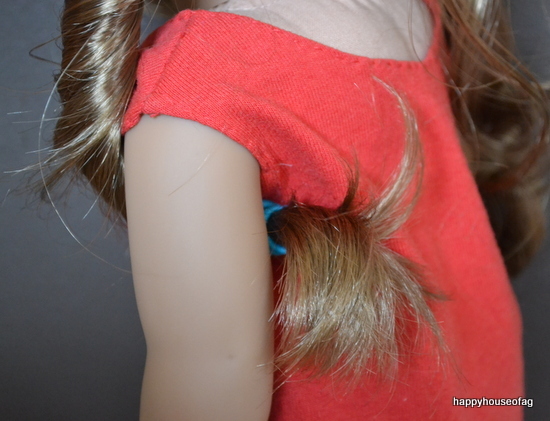 ..
Take a tiny piece of hair from 1 (left side). Cross it over, and join it with part 2 (right side). Repeat, but starting with 2 instead of 1. Fishtail halfway down, and tie it off with the other elastic. 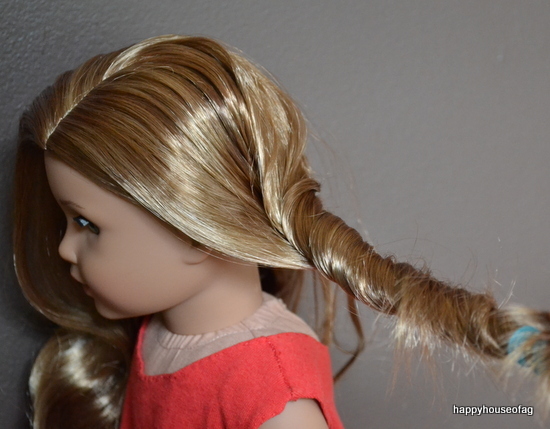 I’m going to show you all how to curl your doll’s hair like *this*! 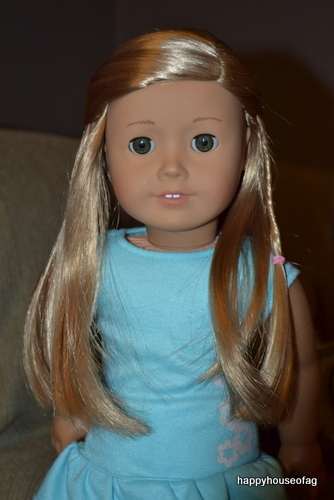 First, squirt and brush your doll’s hair. 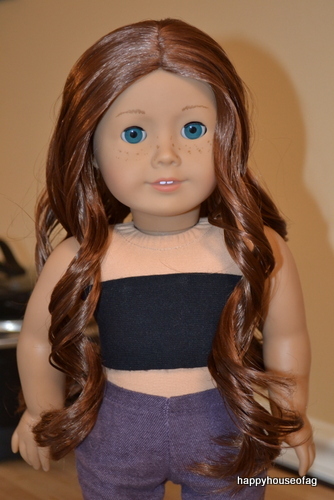 This technique should work on dolls with wavy or curly hair. 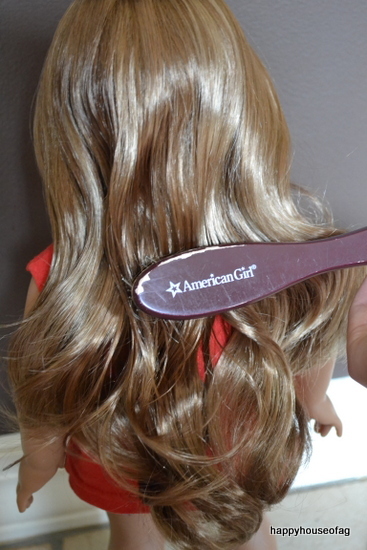 Next, separate a piece of her hair that you want to become the first curl. 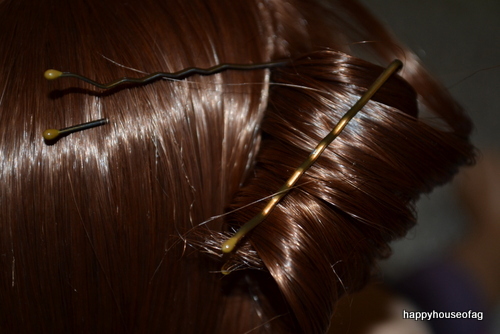 Then take your marker and, starting at the top of the piece of hair, drag it down until it reaches the end. 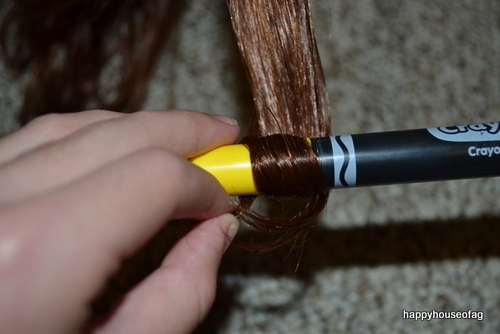 Wrap some hair around the marker, and roll the marker up, so that all the hair is twisted around the marker. The marker should be like this up against her head. 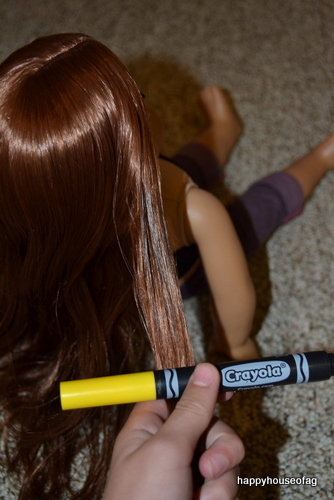 Then slip the marker out, but make sure that all the hair stays in place. 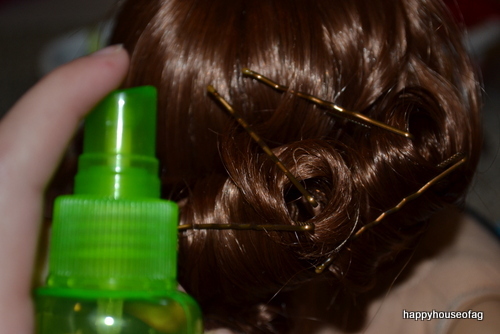 Put a bobby-pin through the curl to help it stay in place. 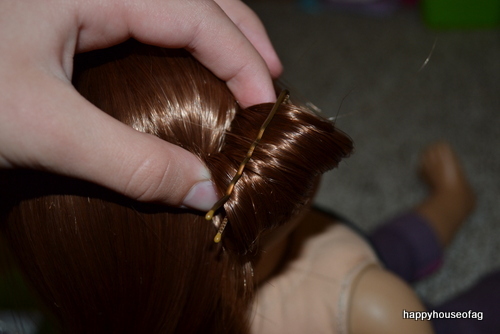 Take another pin and get some of the rolled up piece in it, and then pin it to the doll’s head. Once you’ve done all her hair, mist it. And now, the moment you all have been waiting for . . . I hope you enjoyed, and I would love to know if you try this! 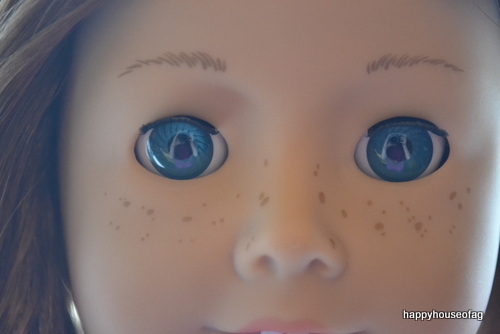 Kate and DollDIYs requested a hair tutorial, so here’s one for ya! Ta-da! 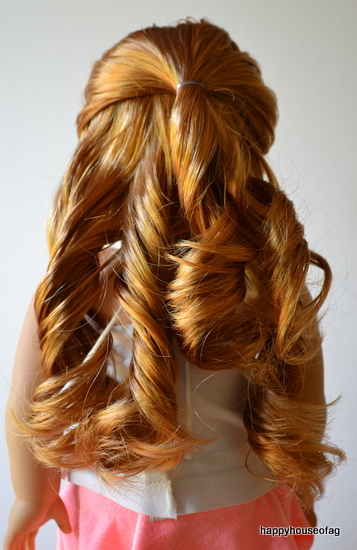 Isn’t it the most twirly hairstyle ever? Anyway, I’ll be showing you how to make a more, eh, humble version. 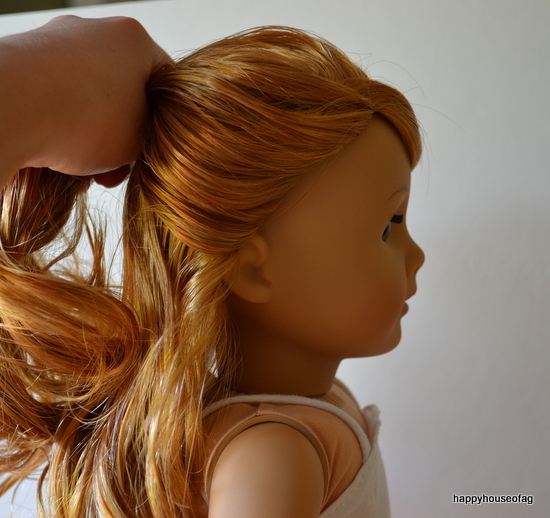 Just start with a basic step: spritzing and brushing your doll’s hair. 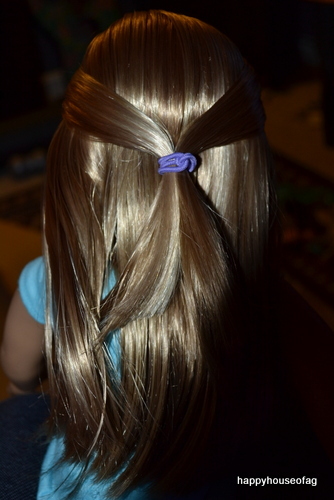 Then take some hair from each side of her face and secure it in the back with your clip/bow. 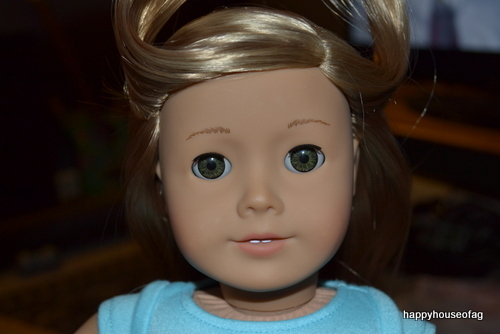 Then take a piece of hair from one side of her head and twist it. 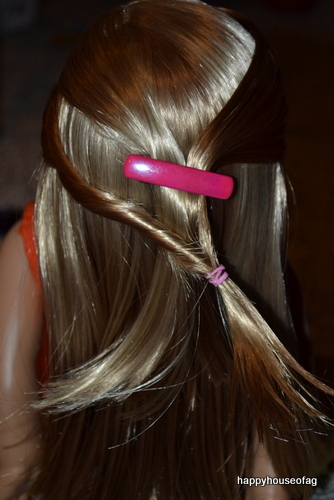 Take part of the hair that is in the clip from the opposite side of the twist and tie that and the twist together with an elastic. Repeat on the other side of her head. 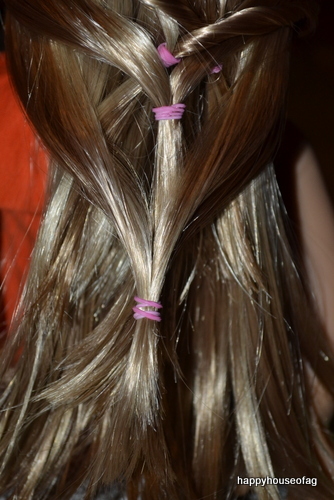 Then take more hair from each side of her face and tie them under what you just did. 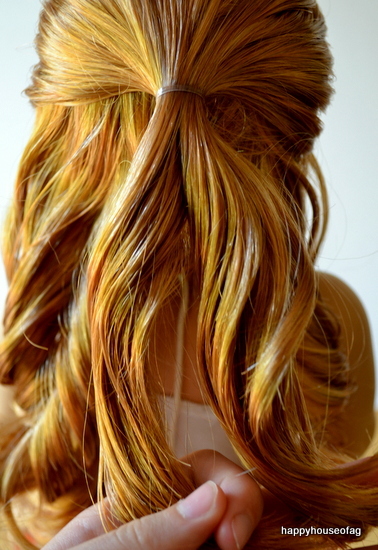 Then take even more hair and tie it down low. 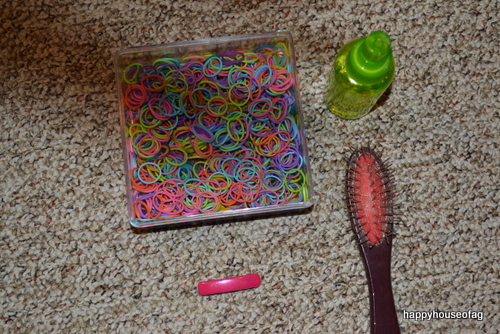 To make it’s twists more ‘tenacious’ you could twist the ones that I didn’t.